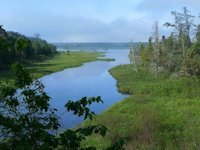 Wisconsin's Big Bay State Park on Madeline Island, the most southern island of the Apostle Islands, is a great weekend or week long retreat for families who love the outdoors but still want a few urban comforts. 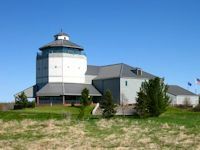 It is located on a peninsula 7 miles from the village of La Pointe Wisconsin where there are restaurants, ice cream parlors, gift shops, golfing, and other entertainments. Close enough for convenience yet far enough to offer isolation from the hustle and bustle. Most campers bring bicycles to ride around the park, tour the island itself, or run into La Pointe for its entertainment. The swimming beach on Big Bay faces east so the morning sun helps warm the waters early in the day but there was still some sun on the beach after 4 pm on the August day we visited the park. 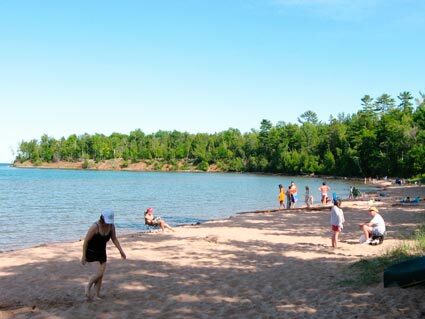 In addition to swimming and biking, other park entertainment includes hiking trails, canoeing or kayaking, rock climbing, beach combing, and fishing. There's also a large open field for games. 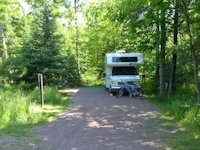 Recently the campground has added electricity to 15 sites so it is more RV friendly (however the dump station is not in the park but is available in the town of La Pointe). There are flush toilets and showers and canoe/kayak rentals available. Bike rentals are available in La Pointe. 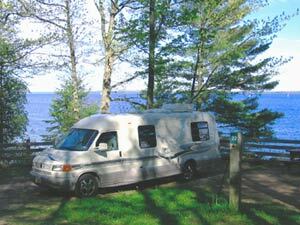 < < < Here's another nice spot to relax and enjoy the view or the peaceful ambience of Lake Superior. 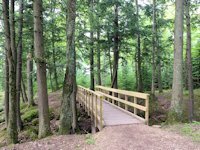 < < < The park offers 9 miles of hiking trails, many with views of Lake Superior. < < < The park offers 60 camp sites, some more open like this one; others quite secluded. Recently the park has added electrical hookups on 15 of the sites. 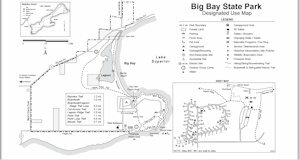 The only other camping on Madeline Island is at the Big Bay township campground north of the State Park. Previously it was primarily a tent campground and somewhat "rustic" in its accomodations. But recently RV sites have been added, plus showers and flush toilets, and other improvements like a huge picnic pavilion. We stayed there in June 2015 and found it in excellent shape. Modern washrooms and showers, spacious campsites, including 22 set up for RVs with electric service. Wi-Fi at the office. Good beach and a boardwalk hiking trail that connects to the State Park. A great addition to the Island.